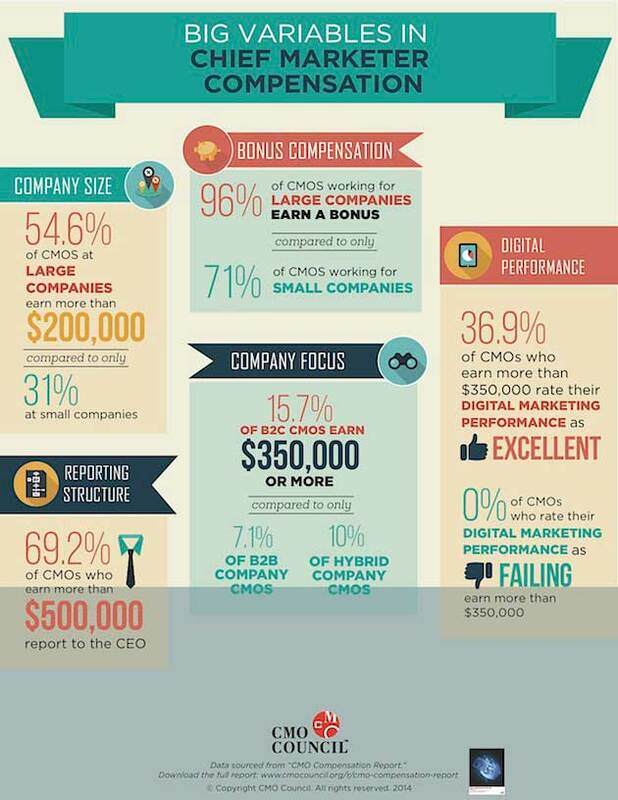 Most chief marketers earn between $ 100,000 and $ 350,000 per year, according to a recent report from The CMO Council. Some 12% earn less than $ 100,000; 39% earn between $ 100,000-$ 199,999; 39% between $ 200,000-$ 349,999; 6% between $ 350,000-$ 499,999; and 4% earn $ 500,000 or more, the global survey of chief marketers (CMOs, executive vice-presidents, senior vice-presidents, and vice-presidents, depending on the top marketing title in each organization) found. The the head of Marketing’s job title (CMO, VP of marketing, SVP of marketing, etc.) also does not seem to correlate with base compensation. Compensation was found to correlate to reporting structure: Respondents making more than $ 500,000 are more likely to report directly to the CEO. Marketers earning the highest levels of base compensation (more than $ 500,000) tend to be focused on driving business performance (e.g., top-line growth, market share, efficiencies, etc. ).